I just got home from several days at the Niobrara Valley Preserve. Dealing with the wildfire has sapped everyone’s energy – even mine, and I didn’t get there until it was mostly over. There are still areas of smoking logs and debris, but they’re surrounded by lots of black, so no one is paying them any attention. The staff at the Preserve are finally getting some time to relax and reflect, and while there’s a tremendous amount of fence to fix, the fire saved years of work removing eastern red cedar trees. I’ll bet it’ll be easier to appreciate that when we’ve all caught up on sleep. The sun rises over the Niobrara River Valley after nearly 58,000 acres burned in wildfires this week. 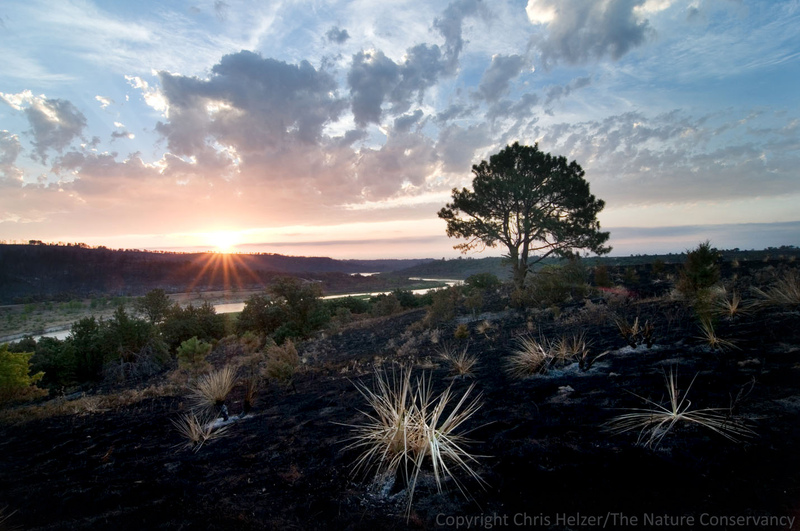 This entry was posted in Prairie Photography and tagged 2012, burned, nature photo, nature photography, niobrara river, niobrara valley preserve, photo, sunrise, wildfire by Chris Helzer. Bookmark the permalink. Stunning photo! Looking forward to more after you rest up and catch up. Thank you to all who worked on the wildfire. Ecologists are this country’s greatest ally. Perfect placement of the various elements in the photo, and perfect timing of the exposure when the sun was just breaking above the horizon. Killer sky too. You certainly have a wonderful eye for composition. Very nice, and good news about the cedars! Striking photo and a positive note about the fire removal of non-native cedar – thanks for letting everyone see and experience the story. The first assistant director of our National Park Service once said, “If you cannot work hard ten or twelve hours a day, and always with patience and a smile on your face, don’t fill out the attached blank.” Your blog always reminds me of what is best about our country. And I’m not just referring to the landscapes. Good to hear things out there are mostly ok. Did you get a sense for how hot the burn was compared to most prescribed burns done out there? Also I was curious whether summer burns have been conducted before on the preserve. Great to have a place like that as a living laboratory. Yes, summer fires have been conducted in the past, so we know what to expect from those. We should see a little stronger forb community next year, especially the shorter lived species.